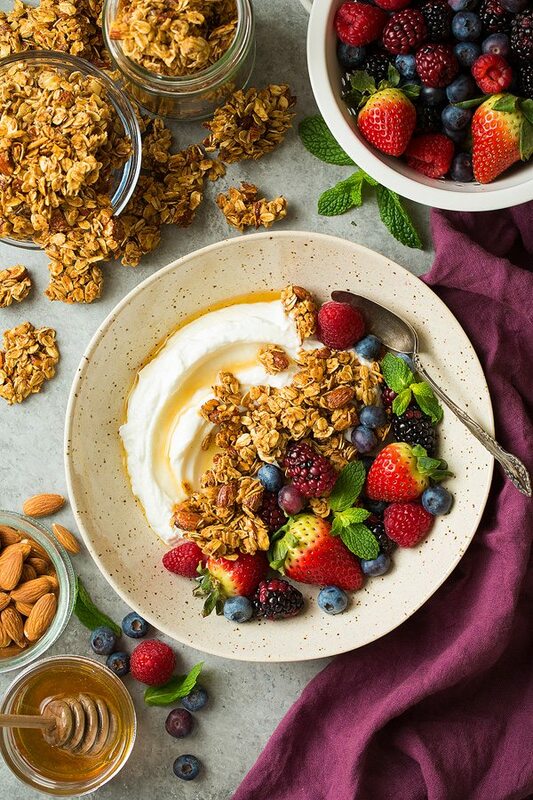 Honey Almond Granola will quickly become a favorite DIY recipe! This is so easy to make, it’s deliciously sweet, perfectly crunchy and you’ll love those bits of nuts! 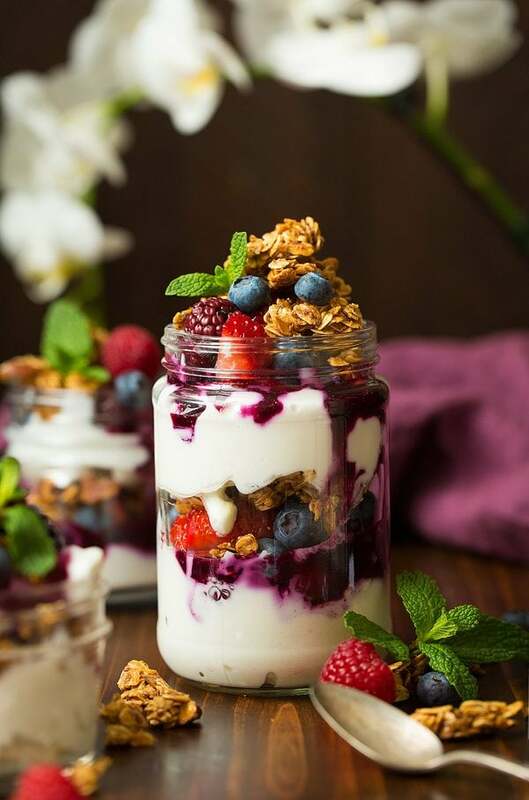 It’s perfect paired with milk or serve with yogurt and fruit, it also makes a great on the go snack. 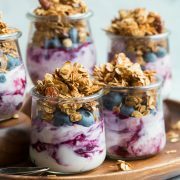 This flavorful granola is made with rolled oats, flax seed, almond and it’s sweetened and flavored with honey, almond extract and vanilla extract. This recipe is a breeze to make yet the end result is even better than what you find in a bag at the store! It’s hearty, crunchy, sweet and just totally satisfying. What Ingredients go into This Recipe? 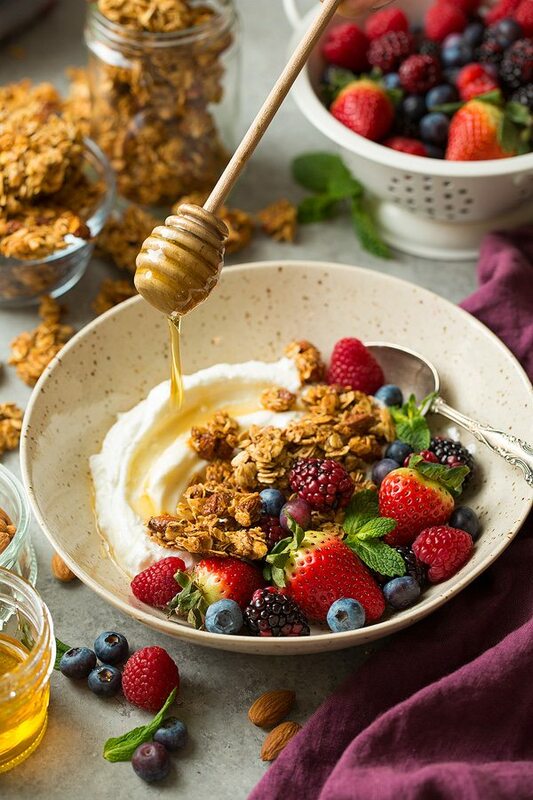 How do You Make Honey Almond Granola? Preheat oven and line baking sheet. In a bowl toss oats, almonds, flax, oil, sweeteners, extracts, egg white and salt. Spread onto prepared baking sheet and bake, tossing halfway through. Let cool and break into clumps. You can add your favorite mix-ins and flavors (check out my other recipes below). Homemade is freshest and doesn’t have preservatives. It’s sweetened with honey, not just sugar. Its cheaper! Those little bitty bags of granola can get expensive, and don’t even get me started on the cost of the bakery granola. Try it with other nuts or dried fruit. Don’t use quick oats. They’re already partially cooked and the texture doesn’t work well here. If you’d like you can cut back on the sweeteners a little but it might not crisp or clump together as well, but at least it would be a little healthier. 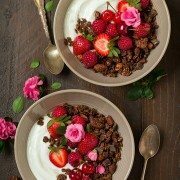 What Can I Add This Granola To? Add it to salads. I love a spinach salad with berries, raspberry vinaigrette, feta and granola. Sprinkle it over pudding or ice cream for some nice contrast. 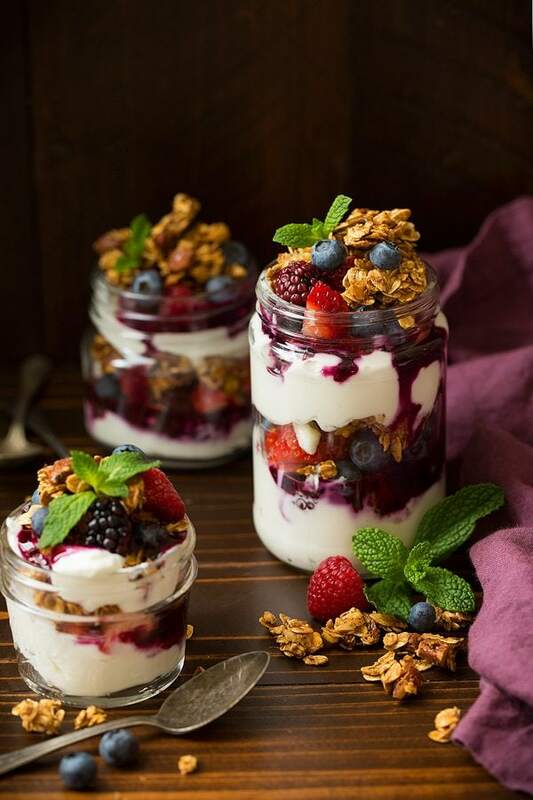 Make a parfait, layered with fresh fruit, yogurt, honey and granola. Make it into a crust for a breakfast fruit tart. Sprinkle it over a warm fruit filling (like apple pie filling) for a simple crisp. Or just serve it cold cereal style with milk. 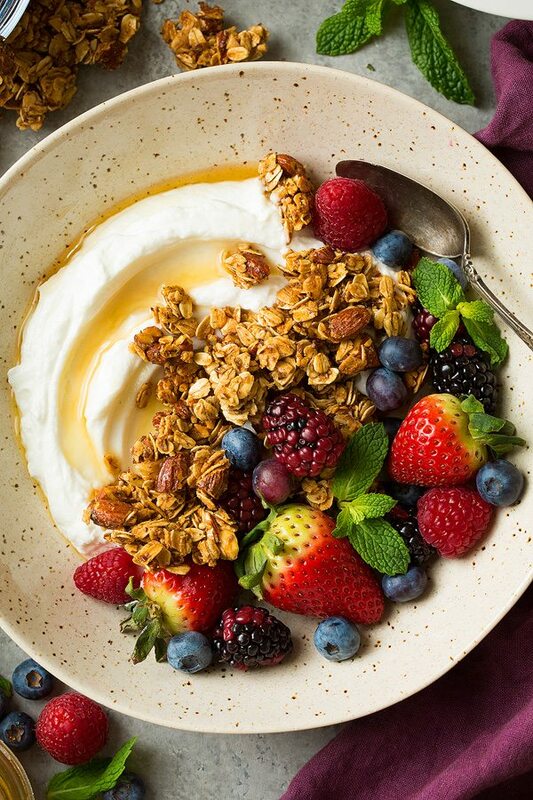 Honey Almond Granola will quickly become a favorite DIY recipe! This is so easy to make, it's deliciously sweet, perfectly crunchy and you'll love those bits of nuts! It's perfect paired with milk or serve with yogurt and fruit, it also makes a great on the go snack. Preheat oven to 325 degrees (if your oven cooks hot be sure to decrease the temperature as needed or the granola will burn. I recommend using an oven thermometer when baking. I always have to reduce my oven by about 15 degrees to get the right temp). Line a rimmed 18 by 13-inch baking sheet with parchment paper, set aside. 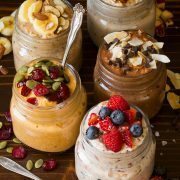 In large mixing bowl lightly toss together oats, almonds and ground flax seeds. In a medium mixing bowl whisk together coconut oil, honey, brown sugar, vanilla extract, almond extract, egg white and salt until very well blended. Pour honey mixture over oat mixture and toss well until evenly coated. 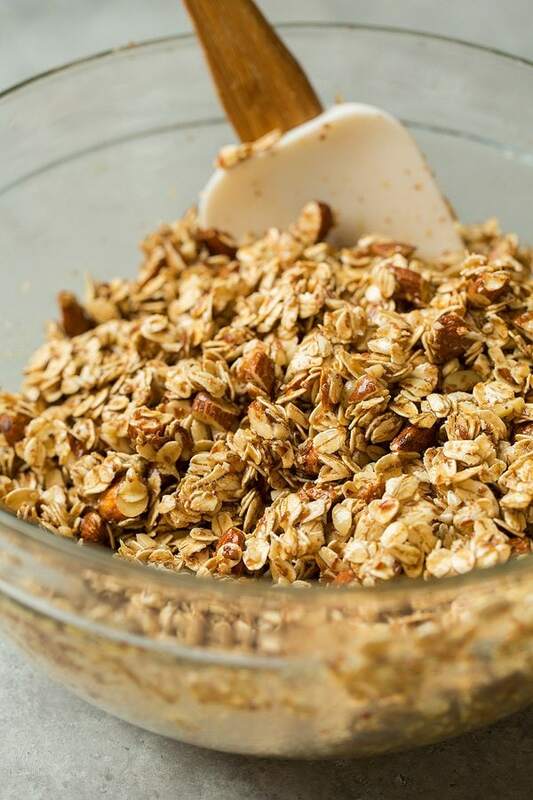 Pour oat mixture onto prepared baking sheet and spread into an even layer. 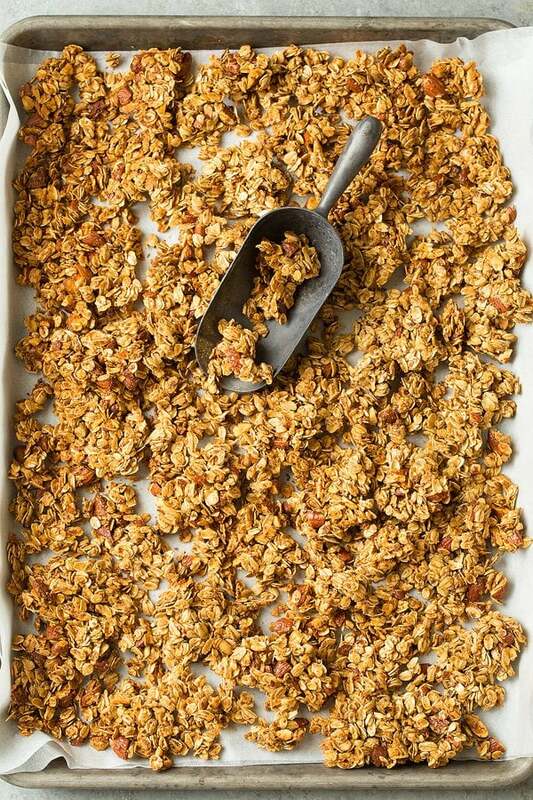 Bake in preheated oven 13 minutes, remove from oven and flip granola with a spatula and spread back into an even layer. 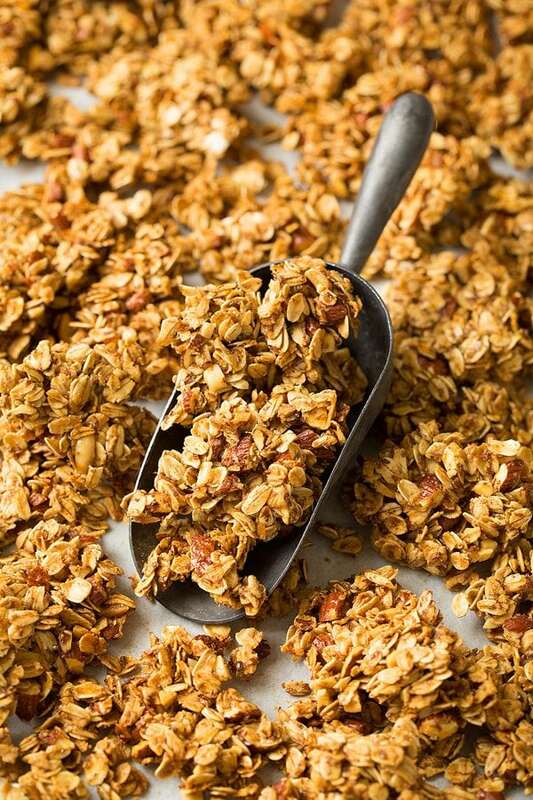 Continue to bake until granola is just lightly golden brown, about 12 - 17 minutes longer (it won't be crisp until it cools, to check for doneness you can place a small piece in the freezer for about a minute or two and see if it becomes crisp. If it doesn't pop the granola back into the oven for a few minutes. After the granola has cooled for about a minute I like to press down on the granola with my hands while it's still warm, I think it helps it clump together more). Let it cool completely, break into clumps then store in an airtight container.